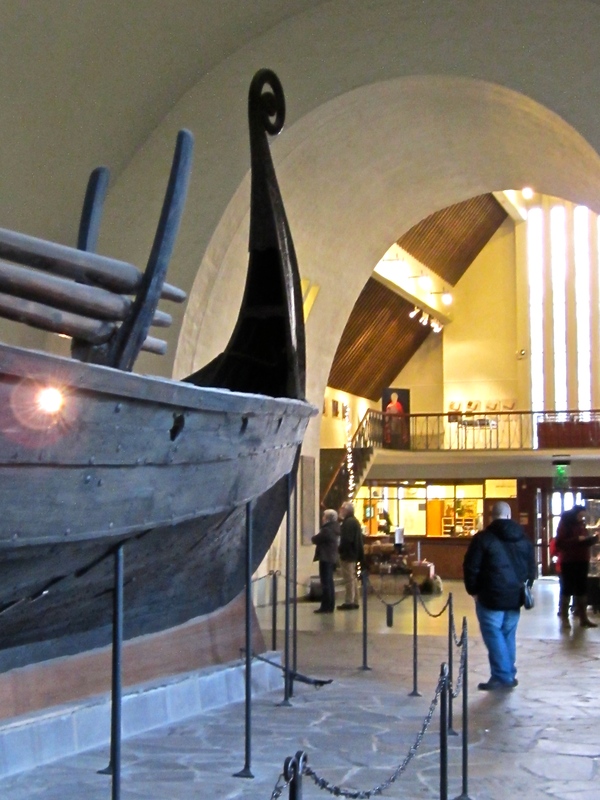 The Viking Ships Museum resembles a cruciform church, with each wing containing a ship. March 19, 2015. “What’s the best thing to see in Oslo?,” is the question I’m often asked by friends and family preparing for a visit. I know I’m a history geek, but I always recommend the Viking Ships Museum. 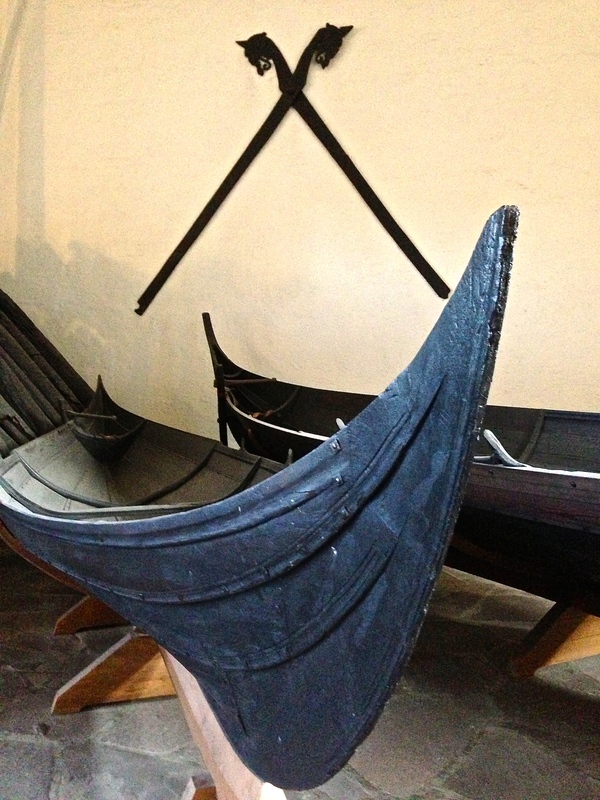 Seriously, where else in the world can you go to feast your eyes on three incredibly intact Viking vessels? We all know about these Scandinavian raiders who pillaged most of Europe and were the first Europeans to touch foot on North American soil. (It’s now pretty much a proven fact — Columbus was late to the party.) So it’s a real goose-bump experience to see the vehicles that made it all possible. 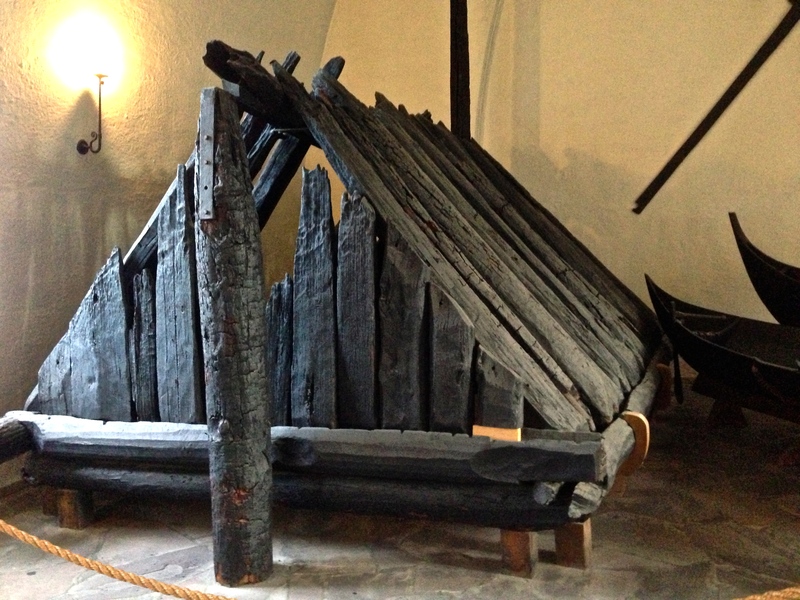 The Gokstad ship, found in 1880, featured a burial chamber made to look like a wooden version of a ridged tent set up on the deck. 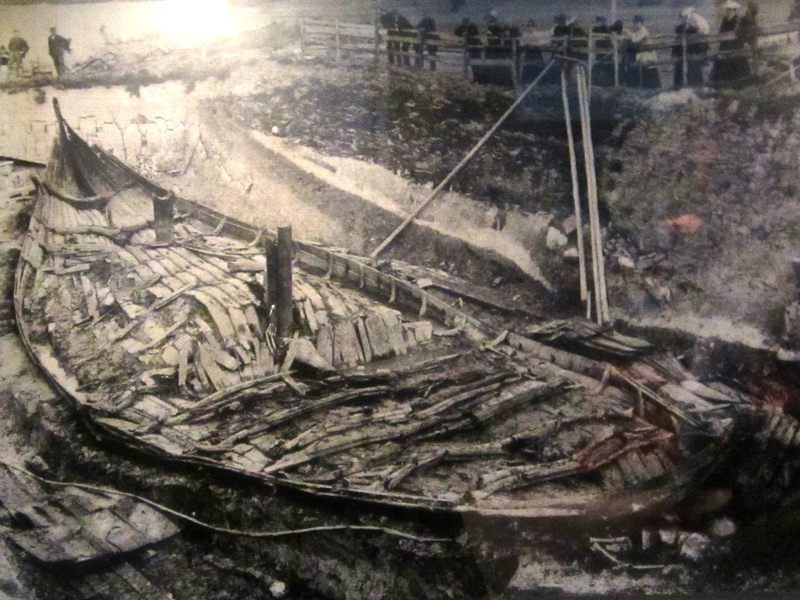 Pictured is the Oseberg ship as it was found beneath a mound of blue clay in 1904. Though collapsed, most all the pieces were there for reassembling. Three of Norway’s burial mounds contained the most perfectly preserved Viking ships yet found, courtesy of tons of blue clay piled on top of them. (Blue clay is anaerobic — no oxygen means no bacteria, and therefore little decay.) On board were the dead, who rested on deck in a wooden replica of a tent, and tons of grave goods that included beds, musical instruments, sleds, carts, farm implements, tools for sewing and weaving, fishing and hunting gear, barrels of apples, wheat, beer, and much, much more. All of it amounts to incredible stuff that tells us about Viking daily life and reveals that, at heart, these folks were farmers and traders as much as they were sailors and raiders. The Oseberg’s ship is pictured here, with its serpent-headed prow restored. The lighter wood is a replica piece. It’s considered the most elaborate and intact Viking ship ever found, and its grave goods constitute the richest Viking burial ever discovered. When you enter the museum, your first sight is of the Oseberg ship, with its spiraling, serpent-headed prow towering above you. Long on style and short on seaworthiness, the shallow-sided ship was built as a karvi — a royal yacht meant for cruising along the coastlines of calm interior fjords. Writhing along the bow and stern are unbelievably intricate carvings of “grappling beasts” that twine together, gripping wrists, grabbing ankles, and generally trying to throttle one another. 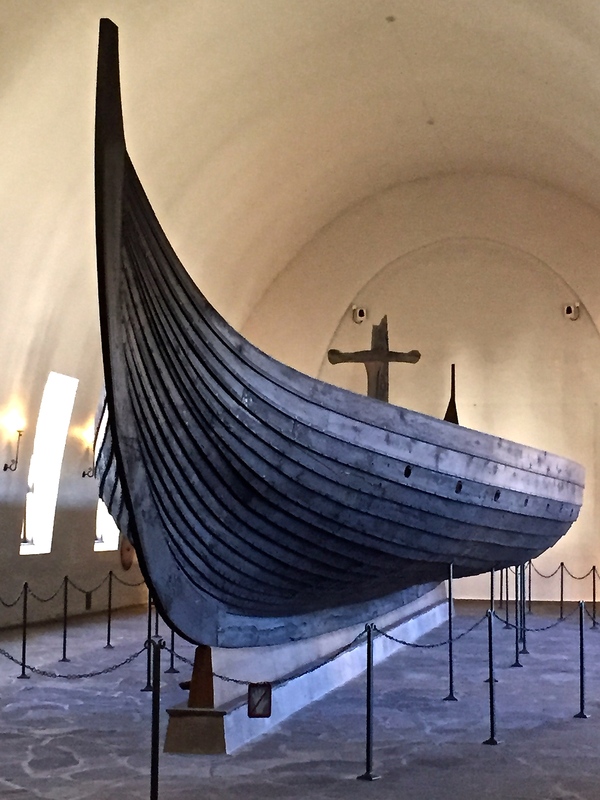 The design of the ship, its general state of wear, and dating of its oak timber tell us that it was built around 820 A.D. and used for about 14 years before being retired as the grave vessel for two women, one of whom was likely a high priestess of Freya, the Scandinavian goddess of love, fertility, beauty, and gold. Grappling men and beasts adorn the prow of the Oseberg ship. 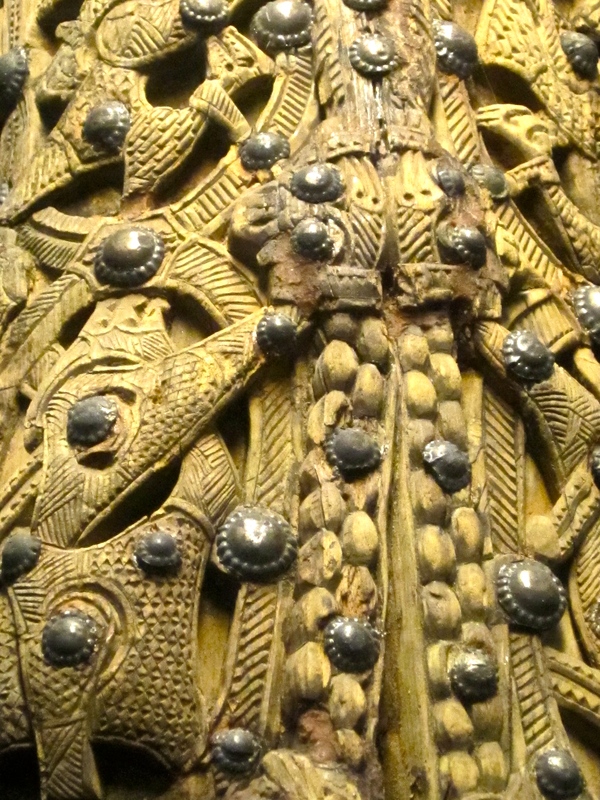 It’s the most elaborately decorated Viking ship ever found. The bow of the Oseberg yacht. Looking down into the Oseberg, you can see the deck, gangway, rudder/tiller, a bailing bucket, and 15 pairs of oar holes. The mast itself held a single sail measuring 968 square feet (90 square meters), meaning that the boat could have reached speeds of more than ten knots. The ship itself measures a little over 70 feet (21.5 meters) in length and about 16 feet (five meters) in width. The heavy bones of the high priestess are on the right, while her younger companion’s rest on the left. The red arrows show pathologies such a arthritis, old injuries, a bulging skull where her pituitary gland would have been, etc. A nearby case holds the bodies of both the high priestess and her companion — perhaps a handmaiden, slave, or lesser priestess who volunteered to accompany her mistress into the afterworld. Various skeletal clues tell us that the high priestess herself probably had a pituitary tumor, which caused her to be rather dwarvenish in appearance: she was only five feet tall (fairly short for a Viking), with a stocky neck, unusually thick bones, and probably hairy to boot. Studies show she suffered from arthritis and osteoporosis and died of cancer at around 80 years old. Her younger, slimmer companion could have been in her early fifties, and although she’d suffered a broken collarbone weeks earlier, the injury probably didn’t kill her. In fact, her bones reveal she was quite healthy, with no other indications as to the cause of her cause of death, beyond willingly choosing to be sacrificed as part of the funeral ritual (common in Viking culture.) DNA testing revealed that she came from Haplogroup U7, meaning she was descended from people who lived around the Black Sea, perhaps further evidence that she may have been a slave. Grave robbers had denuded the ladies of their jewelry and discarded their elegantly robed skeletons in the thievery tunnel. Back in the original burial chamber (the wooden “tent” that rested on the Oseberg’s deck), rich textiles and finely wrought chests, combs, leather shoes, and other personal items proclaimed the women’s wealth. Household tools testifying to the ladies’ traditional feminine skills included several tapestries, looms, a pair of scissors, spindle whorls for spinning woolen thread, a yarn-winder, a sewing box, and a tablet loom still holding a partially completed ribbon. 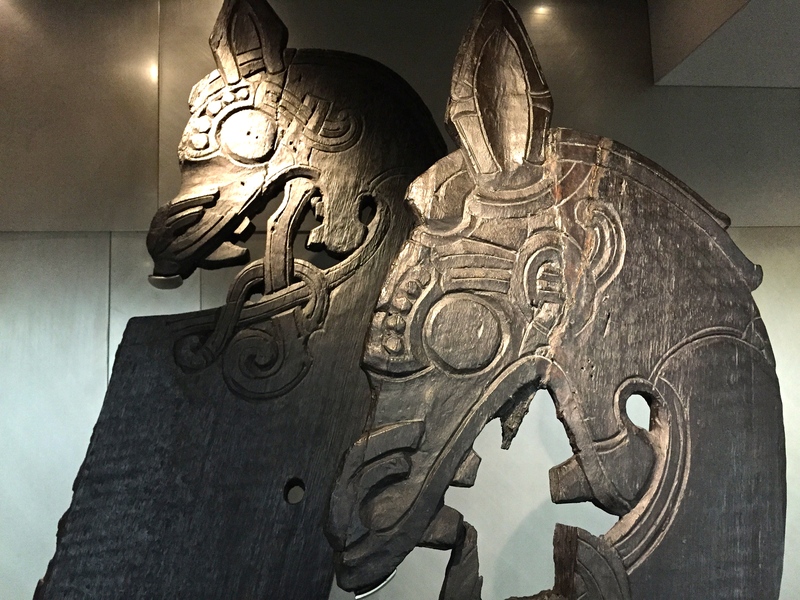 The Oseberg cart features intricate carvings of cats, symbols of the Viking fertility goddess Freya. A horse’s bridle from the Oseberg find. The detail of part of the cart’s cradle features the heads of slaves. A cat-headed staff may have held a rattle used for rituals of Freya. By the way, as a “seiðr” (sorceress), Freya foretold the future, cast hexes, and received half of the warriors slain in battle (the other half went to Odin’s hall, Valhalla). A tablet loom (right) for weaving ribbons like those seen on the left. A closeup of the cat carvings on the cart. The largest sleigh in the Oseberg find once had bright red pigment painted in the recessed areas. Strange-looking metal rattles likely carried on cat-headed shafts, plus the cat carvings on the cart found in the bow of the boat, are what tell archeologists that the priestesses probably served the Viking fertility goddess Freya, who rode in a cart pulled by cats. Plus, encircling the ship were skeletons of a cat, four dogs, a bull and cow, a Eurasian Woodcock, a Red-breasted Merganser, and at least 15 horses (complete with bridles and a saddle). Also discovered on deck were three fancy horse-drawn sleighs, a working sled, two field tents, a wagon, five beds, and lots of kitchen utensils, including knives, buckets, dippers, bowls, lamps, a frying pan, a bread trough, and cauldrons that could be hung over a fire via a bird-footed tripod. A brass-banded bucket that contained apples. A cauldron with a bird-footed tripod and various cooking implements. A detail of a sled’s shaft shows designs similar to Celtic knot work. Perhaps my favorite kitchen item is the “Buddha Bucket,” (seen in the gallery above, bottom right) so-called for the cross-legged figures that fasten the handle to the rim. Despite their yoga poses, these colorful boys are enameled using traditional British techniques, which isn’t surprising considering that Dublin was the Vikings’ slave-trading capital. In fact, many Viking items feature intricate, interlocked designs resembling Celtic knots that show how the two cultures likely exchanged design ideas and influenced one another over time. And the seemingly Asian influence isn’t odd either, considering the Vikings had trading routes that connected them to the Far East. The Gokstad ship, found in 1880, is a less ornamented but more seaworthy utilitarian vessel. It was likely built around 890 A.D. and used for about 10 years before being buried. Like the Oseberg burial, the Gokstad burial contained a ship, but one built more sturdily and with a deeper hull for oceangoing voyages. 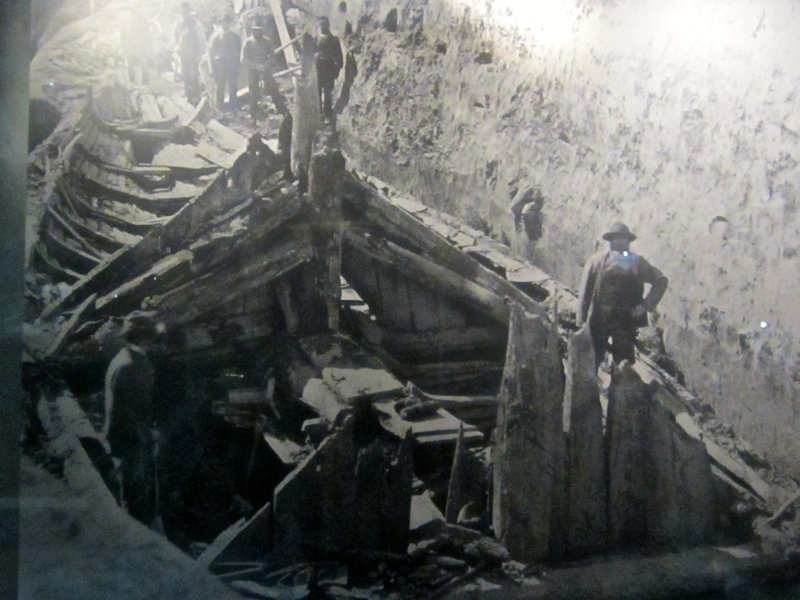 Its steeper sides contained holes for 16 pairs of oars (meaning a crew of 32 men), plus wooden shutters that could be slid over the openings to prevent the vessel from taking on water when under sail. 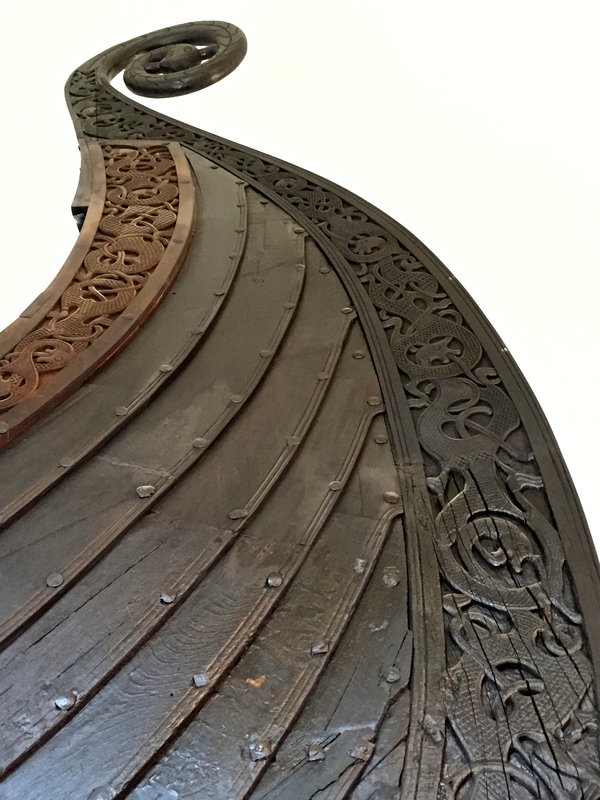 Racks along the ship’s railing allowed shield to hang along its outer sides, which not only encouraged tidy housekeeping but also advertised the arrival of fearsome Viking warriors to those about to be conquered onshore. The remains of 64 shields, painted alternately yellow and black, still hung in place at the time of the ship’s discovery. The bones of the chieftain were found on the Gokstad’s deck, within this burial chamber. Think of it like a wooden replica of the typical rectangular army tent. Hanging on the wall are two horse-headed tent poles. In the foreground are two of the three smaller boats, of a shape and construction still used today on small Norwegian islands. A body of a local chieftain was also found on board in a wooden replica of a field tent. But like the Oseberg burial, grave robbers had divested him of his valuables (weapons), although his bones were allowed to remain in repose upon the burial bed. The burial chamber itself contained remnants of the dead man’s clothes, his fishing gear, and a game board with one antler gaming piece. Skeletons of 12 horses, eight dogs, falcons, and two peacocks surrounded the ship. And on its deck rested a sleigh, poles for a field tent, and three small but elegant boats built in a style still used today in many Norwegian villages. The Gokstad ship is almost 79 feet (24 meters) long and about 16 feet (5 meters) wide. Its single sail measured 1,184 square feet (110 square meters) and would have made it possible for the ship to reach speeds of 12 knots. This map shows you where Vikings ventured worldwide. Archaeologists think that the Gokstad ship may have been capable of sailing as far away as Iceland. In general, Norwegian Vikings headed west to Britain, Iceland, Greenland, and the Americas, while the Danish Vikings focused on Central Europe and the Swedish Vikings concentrated on Russia and points east. In fact, the name “Russia” comes from the Medieval Latin word “Rus,” meaning “rowers” or perhaps even “red-haired,” in reference to the Swedish Vikings who established the first Russian principality near Kiev. The skeleton of the Gokstad chieftain tells us that he was around six feet tall (183 cm), suffered from a long childhood illness, and died at about age 40. Marks in his skull indicate that he may also have had a pituitary problem, such as a benign tumor, which caused him to have heavy muscle attachments, big feet and hands, and coarse facial features including a bulbous nose and protruding chin. In other words, he was quite a bruiser. But despite his brutishness, he apparently wasn’t strong enough to fend off the attack that ended his life. 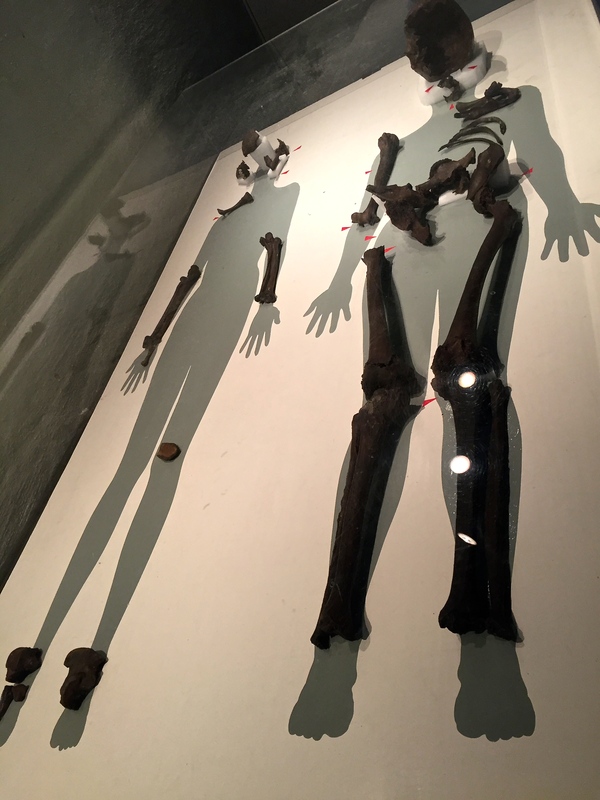 Marks on his skeleton show that he was set upon by two or more adversaries, who sliced open his left knee, stabbed his right thigh, and severed the bone in his right calf in half. (Aiming for the legs of a shield-toting warrior was standard procedure back then.) The injuries show no signs of healing, meaning the Gokstad chieftan died shortly after being wounded. I tossed in this picture to help you see what a Viking field tent might have looked like. The Gokstad ship had one on board, and the burial chamber itself was intended to be wooden, hard-sided replica of a field tent. Check out a closeup detail of two of the horse-headed bed posts from the Gokstad find. During my niece’s visit, we went to hear a lecture by a gentleman who’d created full-scale, functioning replicas of two of the three ships in the Viking Ships Museum. He described how he’d built the reconstructions by hand using traditional Viking tools and explained that he was now working to raise money for the third boat — the Gokstad. His goal was to sail it around the entire coast of Scandinavia, tracing one of the ancient trading routes of his ancestors. At the end of his lecture, he invited us to come for a tour of the boats, which he keeps in a harbor about an hour south of Oslo. So guess what I’ll be doing when summer comes? 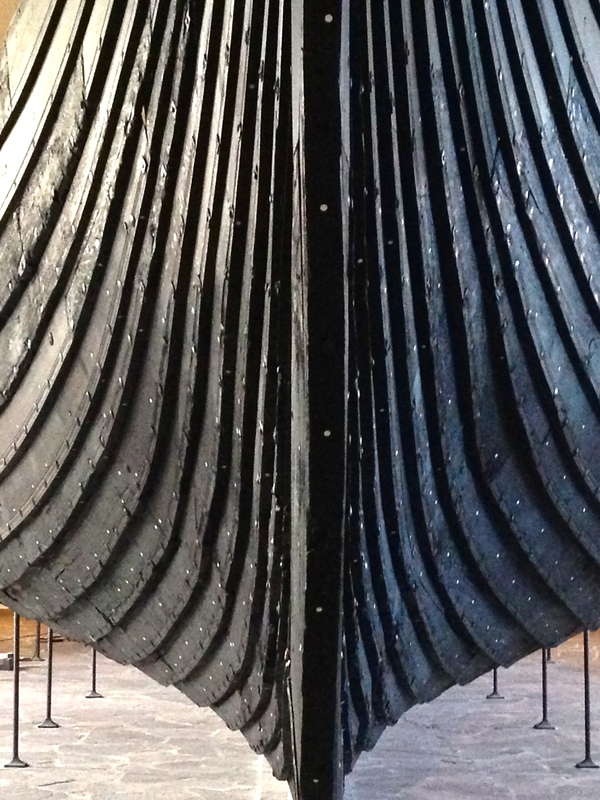 The bow of the Gokstad shows lapped oak planks joined by metal and wooden rivets. From this dedicated man I learned a fun tidbit about the ship. A group of Norwegians had built a replica back in 1893 and sailed it across the Atlantic, up the Hudson, through the Erie Canal, and into the Great Lakes to Chicago for the World’s Columbian Exposition. Funny that I’d never heard this story during all the years I’ve worked for the Museum of Science and Industry and The Field Museum, both of which can trace their origins to the 1893 World’s Fair. Apparently, the ship’s tip and tail still sit in MSI’s vaults, but its body now rests in Geneva, Illinois, where folks can tour it on weekends. Who would’ve thought I’d have to come all the way to Norway to learn this bit of Chicago history? But if you want to see the original ship and its associated grave goods, come soon. Many of the items were preserved using alum and are decaying from the inside out. If researchers don’t find a solution quickly, it’s predicted that we may be the last generation to see such spectacular finds. Nova has a series on The Vikings, which the replay every so often. The segments on how they built these ships is amazing.